Establishing healthy sleep habits for your baby is hard enough, but there are safety concerns that are paramount. The American Academy of Pediatrics publishes extensive guidelines for safe baby sleep, and if you have two hours of free time I encourage you to go read them. 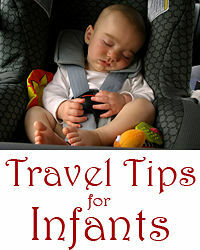 Since you probably don’t have two minutes of free time, let me boil it down for you in these brief safe sleep tips. 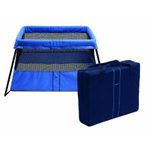 See our article on Back to Sleep safety guidelines if you want the detailed recommendations. 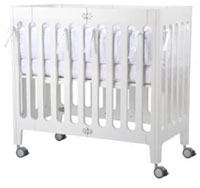 Many of the recommendations for safe baby sleep center around how and when you put your baby into the crib. 1. Put your baby in the crib to sleep. A newborn will sleep just about anywhere, but that doesn’t mean that you should allow this to happen regularly. 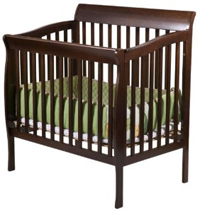 Get in the habit of putting your little on in the crib or bassinet for naps and for nighttime sleep. 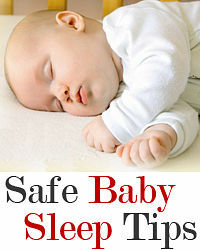 It’s the safest place and it’s a good habit to establish early because it helps with baby sleep training later on. The Back to Sleep campaign is a public baby sleep safety program encouraging parents to put babies on their backs (as opposed to their bellies) to sleep. Make sure you do that, too. 2. Only the baby goes in the crib to sleep. In other words, no loose blankets, stuffed animals, pillows, or other things that pose a suffocation hazard. 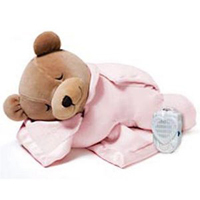 You should, of course, dress your baby for sleep and use a swaddle or sleep sack to keep him safe and comfortable. That’s it. This also means no crib bumpers! 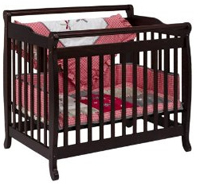 I know they’re cute and seem like they would protect your baby’s soft little body from the unforgiving wooden bars of the crib, but they’re not worth it. 3. Provide a firm sleep surface. You probably think that your baby should only sleep floating on soft, fluffy clouds, like the angel that she is. 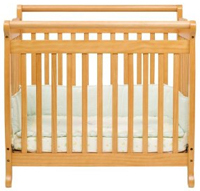 But a firm sleep surface is recommended: a crib mattress that’s fitted for the crib that you have. It’s safe because your baby’s little face can’t sink into it. 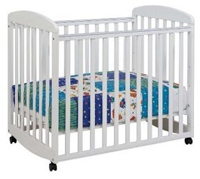 Luckily, most cribs and mattresses have a standard size (52″ by 27″). 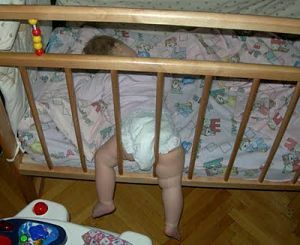 Most importantly, there shouldn’t be any gaps between the mattress and the crib. Curtains, mini blind cords, electrical cords, or other strangulation hazards. These need to be out of arm’s reach for your baby. 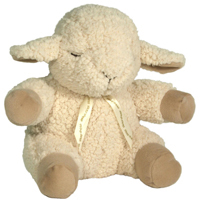 Heavy, sharp, or otherwise dangerous objects that could fall or be pulled into the crib. A big lamp on a cord is a classic example. Directly in the airflow of a heater or air conditioner. Just make sure they’re not pointing directly into the crib where your baby will be sleeping. Safe baby sleep guidelines from the AAP also cover some best practices for feeding and soothing your baby at night. There are plenty of good reasons to breast feed your baby, enough that I don’t need to dwell on them here. What you probably didn’t know is that research shows that breastfed babies have a reduced risk of SIDS. This likely has to do with the attentiveness of a mother that breastfeeds, but whatever the reason, any nursing you can do will benefit your little one. Here’s something I always recommend for baby sleep training, and it happens to have a safety benefit as well: offering a pacifier at bedtime. Researchers aren’t sure why, but pacifier use has a slightly protective effect against SIDS. 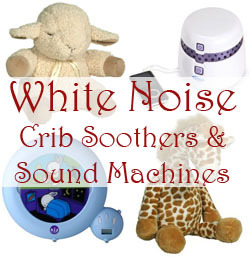 It’s also great for soothing your baby back to sleep after a wake-up. 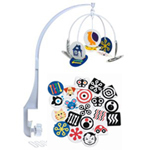 See our reviews of the best baby pacifiers for some good options. Perhaps surprisingly, the AAP recommends sleeping in the same room as your baby. 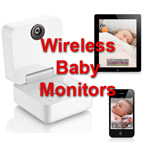 This allows parents to keep a closer eye on the little one overnight, and it’s also convenient during those first few months when the little one wakes up every 2-4 hours. Now that we’ve covered the do’s, it serves to cover some of the things you should not do. These are things to avoid. It’s not good for you or the little one. It’s not even good to allow people who smoke around the baby — the chemicals from tobacco smoke linger in hair, clothes, cars, you name it. 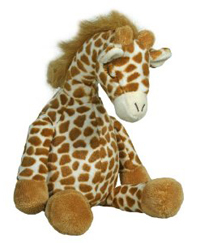 When these things come near your baby, your little one’s perfect, just-formed lungs take them in. There’s no better motivation for someone to quit smoking than a sweet little baby coming into their life. 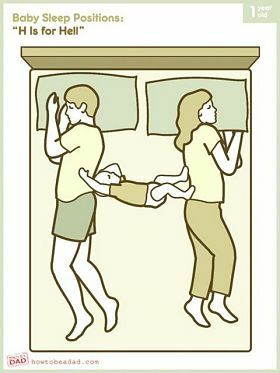 I’ve already spoken out against co-sleeping, but some people are going to do it. That’s their prerogative, but one time it must absolutely be avoided is when one or both parents have used alcohol, drugs, or a sleep aid. These simply make adults less attentive and more likely to put the baby in danger. Avoid at all costs. 10. 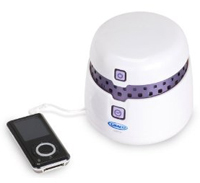 Sleep positioners, heart rate monitors, and other hyped-up products. There are people that will try to sell you just about anything, and they’ll use your baby against you to do it. 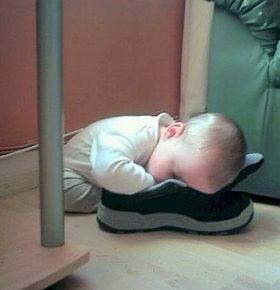 You don’t need, and you really should not, use baby sleep wedge or positioner. Once your baby wiggles out of it, it’s just a suffocation hazard. They do make home heart rate monitors, but unless advised to do so by you pediatrician, don’t use one. They aren’t for casual use and might lead you to a false sense of security. Also, the consumer products are a joke compared to the high-tech devices we were required to lease (at outrageous prices) to monitor our preemie twins at home. Bottom line, don’t buy the hype! Use common sense, be attentive, and your baby will be just fine. For many of us, an hour of sleep can make all the difference in the world. This is especially true when you have a baby who’s been waking up every 3-4 hours for the last few months. At the newborn stage, there’s no avoiding it. Infants need to eat every 2-4 hours and they really shouldn’t sleep longer than 5 hours before around the age of 3 months. That’s just the joy (price) of bringing a newborn into the world. 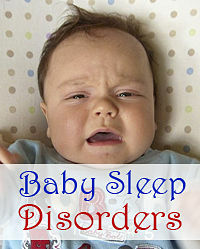 Baby sleep, just like feeding and physical development, tends to progress in phases. 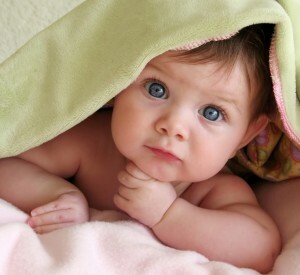 Sometime between 3 and 6 months (adjusted age), your baby may start sleeping a bit longer. At least, he probably has the capability to do so in at least one sleep stretch. Ideally, that’s when you should be sleeping, too. 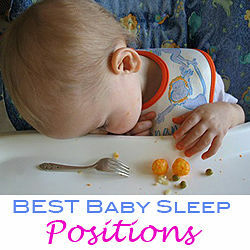 Sometimes this isn’t possible because the timing is off; our own little ones seemed to favor the morning nap period. This is normal. Let’s assume that your baby is at least 4-6 months old, follows something of a daily routine, and sleeps at least a few hours at night. In this article, we’ll discuss the benefits of, and offer some tips for, helping baby sleep longer. 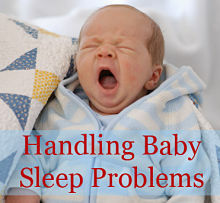 Why Help Baby Sleep Longer? 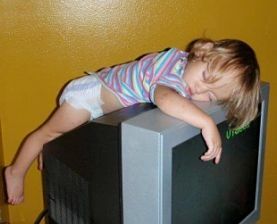 Most parents we know really turn a corner when their little one goes for five or seven hours at night. They start showering regularly and looking less zombie-like during the day. Since you’re here, I probably don’t need to sell you on the idea of helping your baby sleep longer, but let’s talk about the benefits anyway. Cognitive development. It’s during sleep that memories are made permanent, which is a big deal for an infant. Longer sleep periods are likely to help remember all the things they learned during the day. Physical recuperation. For both baby and exhausted parent, the physical recovery that sleep offers is a must. Muscles rest, blood vessels are repaired. Avoiding sickness. Scientific evidence suggests that the immune system is stronger while sleeping. It follows that more sleep can help prevent sickness. That’s a good thing, because helping a sick baby to sleep is even harder. It goes without saying that when the baby sleeps longer, so do you. Thus you’ll reap all of the benefits above as well. According to a recent study on baby sleep intervention, baby sleep problems are linked to maternal depression and other long-term problems. There are plenty of good reasons to want to improve your baby’s sleep habits. So what can you do to help your baby sleep longer? There are many things. 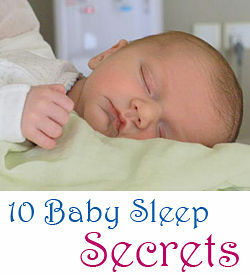 All of these are (in my opinion) universally good baby sleep tips, but you might want to try one at a time, for at least 2-3 days, to figure out what works and what doesn’t. This tip comes first because it’s really important. By setting an early bedtime, you encourage your little one’s sleep cycles to coincide with circadian rhythms. 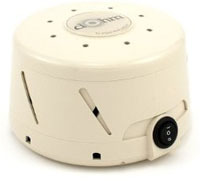 You also prevent over-tiredness from diminishing his sleep quality. 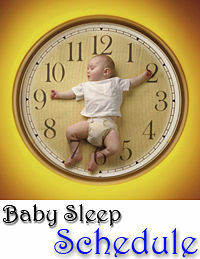 For more benefits and some practical how-to advice, see our article on early bedtimes for baby. Your little one is always growing, and with that comes ever-growing nourishment requirements. In other words, your baby will keep eating more and more. His capacity to fill up will continually surprise you, so make sure that you’re giving him a full belly before bedtime! Once our boys started eating solid food (on the pediatrician’s advice), we began offering them a small bowl of cereal just before the bedtime bottle. Fill that little belly with warm, nourishing food and your little one will have the “slow burn” to sleep longer at night. If you’re not using an overnight diaper for your little one, I have great news for you. 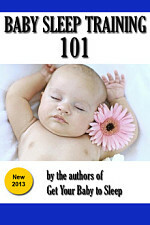 This is probably the simplest sure-fire way to help the baby sleep longer at night. I’ve written an entire article on why diapers are important for baby sleep. Nighttime diapers are super-absorbent — probably three times as much as a normal diaper can handle — which means your baby’s bottom will stay drier for longer. That means more sleep for the both of you! Along the same lines, dressing your baby comfortably (and appropriately) for sleep is essential. A clean set of soft pajamas (long sleeve unless it’s summer time) will help accomplish this. True, you can often put a baby to sleep in whatever they happen to be wearing, but a good set of sleepwear ensures warmth and comfort that might help go the extra mile. 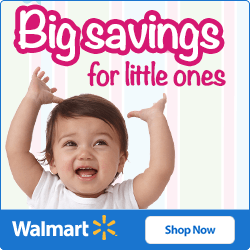 See our reviews of the cutest baby pajamas and sleep sets. This past fall, we noticed one of our boys was waking up about an hour earlier than usual. We couldn’t figure out out! None of the other tips above seemed to help. Finally we realized that due to the daylight savings time change, sunrise came an hour earlier and sunlight poked in around the room-darkening shade, right onto our boy’s face. 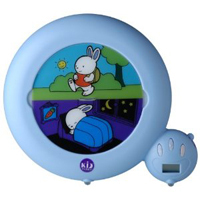 Another time we found that a child’s digital watch had an alarm that went off in the middle of the night. We’ve also had problems with barking dogs and noisy neighbors. If you can find causes of early wake-ups like these and eliminate them, your baby is going to sleep longer. 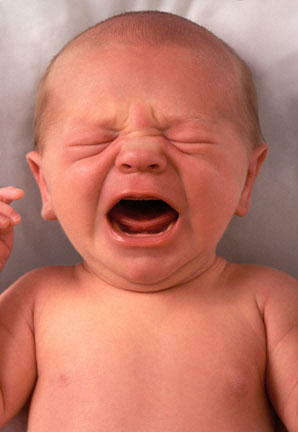 See our article on 7 reasons your baby woke up last night. I saved my last tip for last, because this is probably the most fun way to help your baby sleep longer. It’s simple, too: wear him out during the day. Ever notice how a morning spent playing outside has your little one has him sleeping soundly for the rest of the afternoon? 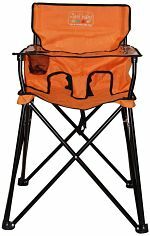 It works great playing in spring, summer, fall, or even winter. If going outdoors isn’t feasible, a high-energy indoor activity can do the trick. 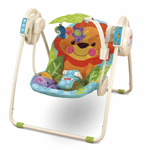 See our reviews of jumpers and activity gyms for some great toys for baby exercise. With a little work, you can extend your baby’s sleeping hours, and reap all of the benefits by doing so. Good luck!